Welcome to the first instalment of Tiny Thursdays, a column dedicated to exploring Tiny Leaders decks, with an emphasis on the financial side of the cards used in the deck. Tiny Leaders is a fledging format. After the Cambrian-like explosion the format experienced early this year, the hype for the Tiny Leaders simmered down. However that does not mean the format was a flash in a pan. While the incredible momentum that propelled the format during the early part of the year died down, the format is still growing. The Tiny Leaders subreddit and Facebook group today has double the number of subscribers compared to when I first wrote about them. Tiny Leaders even have their own official forum which launched early this month, but it has yet to achieve the activity level found in the subreddit and Facebook group. More importantly, Tiny Leaders is still driving card prices, with the latest Tiny Leaders-related increase being Blasting Station. Tiny Thursdays aims to the contribute to the growing Tiny Leaders content out there, and explore the format from a financial perspective. This column will feature a Tiny Leaders brew each week and discuss financially relevant cards in the deck. If there are any decks you would like to see featured, feel free to leave a comment below or catch me at Twitter @theguoheng. This week, we shall start with a leader I’ve always wanted to build around: Shu Yun, the Silent Tempest. Shu Yun is most often compared to Geist of Saint Traft, one of the undisputed top tier decks in the format, with some arguing that it would be better to just cut the red and go Geist if you are gunning for a highly competitive build. After all, Geist decks are more streamlined and the majority of their card pool overlaps with those used in Shu Yun. There are two reasons why I gravitated to Shu Yun rather than Geist. First off, having Red gives you more options for efficient removals like Lightning Bolt, Flame Slash, Fire/Ice and Lighting Helix rather than having to lean on enchantment-based removals like Oblivion Ring and Banishing Light to bolster the number of answers in the list. Board presence king in Tiny Leaders and Red gives you a removal suite that does compromise your tempo, on top of access to much needed sweepers in the sideboard like Anger of the Gods and Pyroclasm to shore up the matchup against swarm decks like Ezuri Elfball, and the increasingly popular Grenzo Goblins. The other impetus to run tricolor Shu Yun over bicolor Geist of Saint Traft is Dack Fayden. Dack Fayden is probably the best planeswalker you can run in Tiny Leaders due to the ubiquity of Swords in the format. An unanswered Sword steals games and nothing turns the tide like stealing an opponent’s Sword and bashing him or her with it. From the playtesting I did with Shu Yun, I don’t think I have lost a game in which I stole opposing Swords. Dack’s +1 was surprisingly useful even though it does not generates card advantage. Dack’s Faithless Looting filters away those late game Mana Leak and unwanted lands. Dack’s only downside is that he is already $27, and I could not list him as one of the pick-up targets in the next segment. This Shu Yun list was designed based on the same philosophy Modern Jeskai ascribes to, that is to out-tempo and out-value your opponent. The deck switches gears at ease, depending on the matchup and draw and utilizes a suite of cheap, efficient removals to allow you to mount your offensive and control the board at the same time. Young Pyromancer and Monastery Mentor fortify your board position while you cast answers to control the board, pulling you ahead both in the tempo and card advantage race. Stoneforge Mystic digs you the Sword for the occasion. Mantis Rider is a good tempo creature that plays the role of attacker and defender. The removal suite consists of the usual Jeskai fare, a.k.a. the best one mana removals in the format. I’ve added a Condemn as an extra one mana answer because I realised that one mana removals were something I always love drawing while I was playtesting the deck. They always trade up and as a tempo deck, it’s exactly what I want. The more expensive removals, Fire/Ice and Electrolyze usually net card advantage. Detention Sphere and Council’s Judgment are necessary evils to answer opposing Swords. Feel free to trade one-for-one in the early game. We have the ability to refuel with Ancestral Vision and to some extent, Dack Fayden. 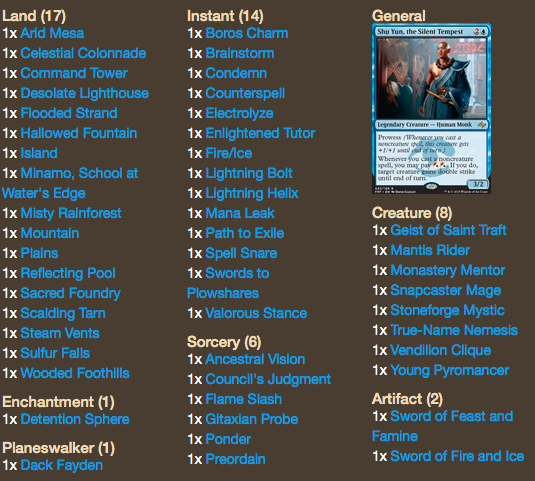 This build guns for the midrange game, which is why I’ve included Ancestral Visions in the list. Now that let’s take a look at the cards in the deck that are financially relevant. 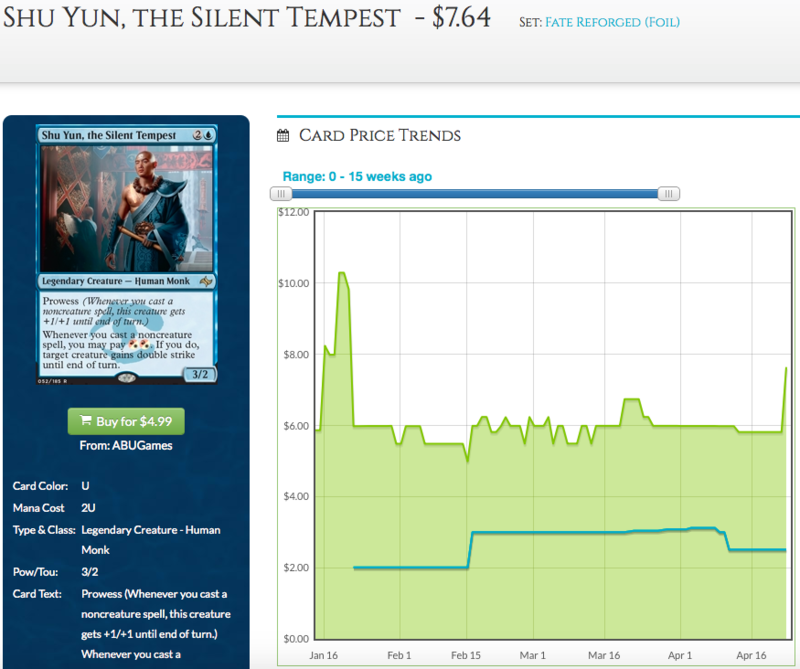 The graph above depicts Shu Yun’s foil price. I’ve always preferred to invest in foils for cards that are used as commanders or leaders. They tend to generate a larger return and more importantly, buffer better against reprints. Shu Yun foils at $7.64 denotes a 13.6x multiplier on non-foil copies, which are going for a paltry $0.46, signifying his popularity both as a commander and leader. Shu Yun has been getting a lot of attention as a commander since he was spoiled, and rightfully so. Shu Yun is one of the most fun to build around commanders to come out from recent sets. There are multiple ways to build Shu Yun: you can either go voltron, or thread down the combo route. And Shu Yun is allegedly quite sick in 1v1. 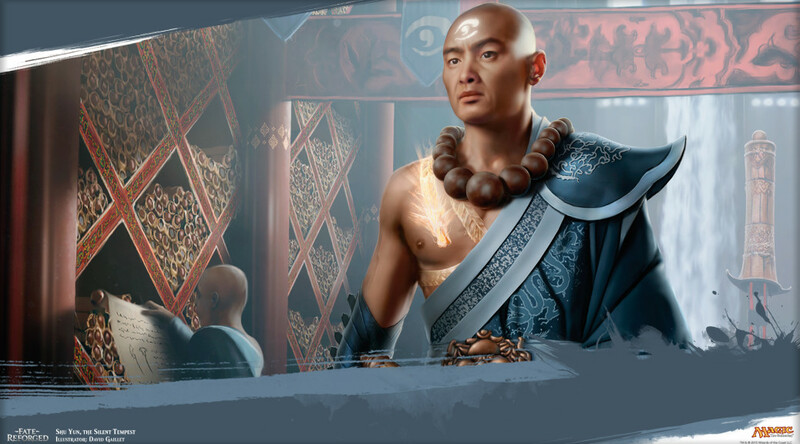 Shu Yun is the only Jeskai leader in Tiny Leaders, which explains his tremendous popularity in the format. Jeskai has always been a competitive color combination in eternal formats and prior to the printing of Shu Yun, Tiny Leaders players have to resort to a generic 2/2 ‘legendary creature with a UWR casting cost’ to play Jeskai. Does Shu Yun’s popularity in Commander and Tiny Leaders make foil copies a good pick-up? Certainly. Just not right now. For two reasons. First off there is something peculiar going on with Shu Yun’s price. Shu Yun’s foil buylist price dropped 24% from $3.12 to $2.51 two weeks back. However, two days ago Shu Yun saw his foil price hike as one major vendor increased their price for foil Shu Yun. Whatever happens, it would be safer to wait until Fate Reforged hits peak supply at the end of May when DTK-DTK-FRF drafts are displaced by Modern Masters 2015. Desolate Lighthouse, which also sees play in Modern Scapeshift and Modern Splinter Twin, besides being a good utility land in Commander and Tiny Leaders, is just a $0.54 card. And Desolate Lighthouse would not be reprinted in Modern Masters 2015. 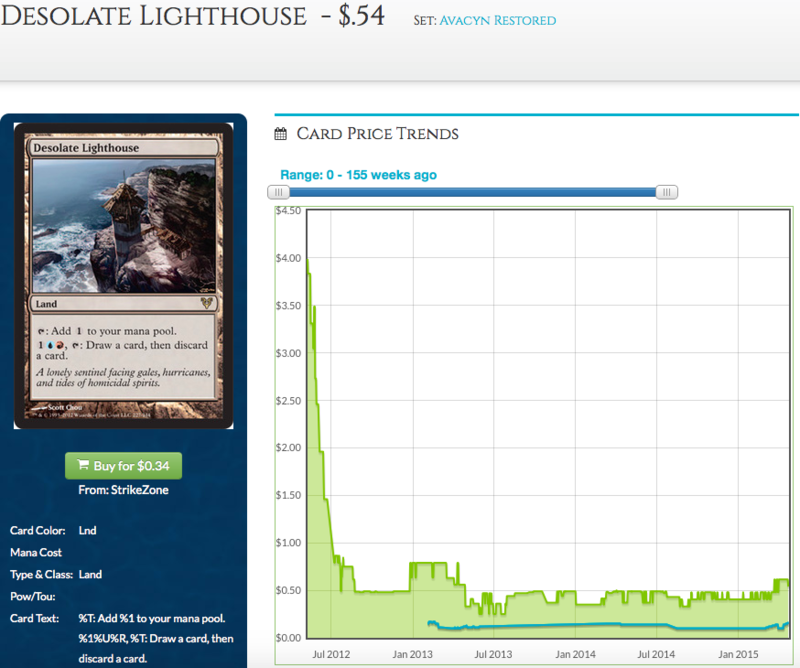 I think non-foil Desolate Lighthouse is a great pick-up at its current price. Foils are at $6.08, which is a whooping 11.2x multiplier from the non-foils. Either the foil is overpriced, or the non-foil is underpriced, and with the Modern and Commander play it is seeing, I am compelled to think that it is the non-foil that is underpriced. Detention Sphere is another card in the Shu Yun list above which I think is underpriced. Detention Sphere is also a mainstay in Geist of Saint Traft Tiny Leaders and is a strict upgrade to Oblivion Ring as it catches those pesky tokens on top of everything else. Token strategies are not insignificant in the format. There are spirit tokens from Teysa and Lingering Souls, Grenzo’s goblin tokens, Thopter Foundry tokens, Bitterblossom tokens and the list goes on. 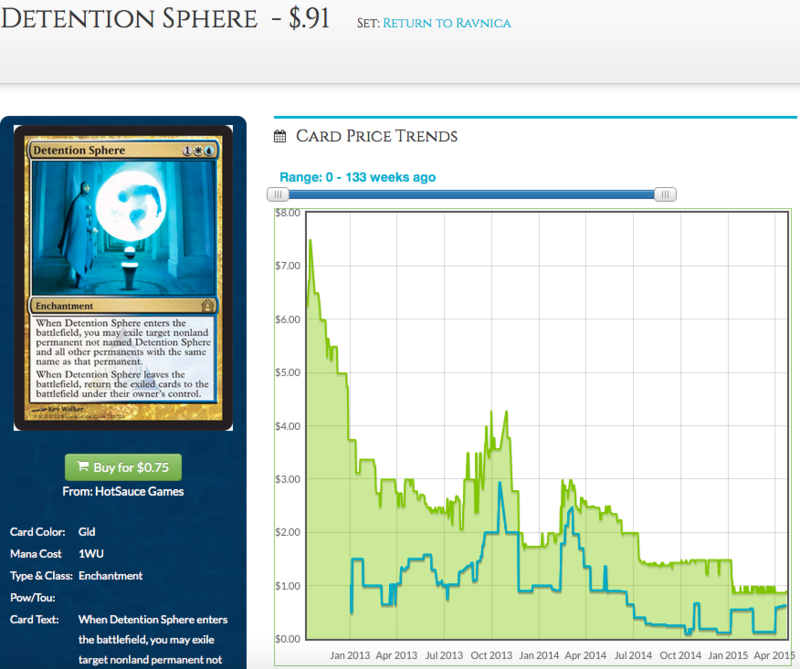 Detention Sphere is a decent buy in at under $1, but I would not go in too deep. It is a popular enchantment in Commander and could well be reprinted in the next Commander set. That is all for this week’s Tiny Leaders segment. If there are any decks you would like to see featured, let me know in the comments below or beam me at Twitter @theguoheng.